Who could honestly resist those cheeks and that smile? Could Evan be any cuter? He is an inquisitive little boy that loves to talk. Evan honestly never meets a stranger, especially when they want to talk about cars or riding bikes. When things are going well, Evan is a chatterbox, however when he encounters change he finds it very difficult and can shut down. His behaviors need to be closely monitored with adults and peers as he can become aggressive and exhibits some inappropriateness. All of Evan’s needs are currently being addressed through therapy and medication. 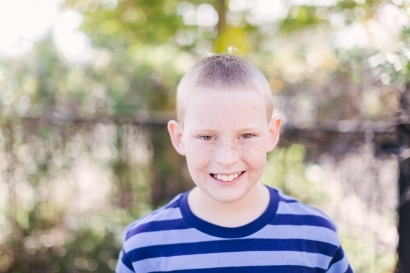 He needs a forever family that will understand that Evan doesn’t choose to be this way, his past has influenced his behaviors and with structure, consistency, and advocacy, he could have a chance to be a little boy that develops into an amazing young man. If your heart was touched by Evan’s smile, I challenge you to fill out the inquiry below. Are you his forever home?